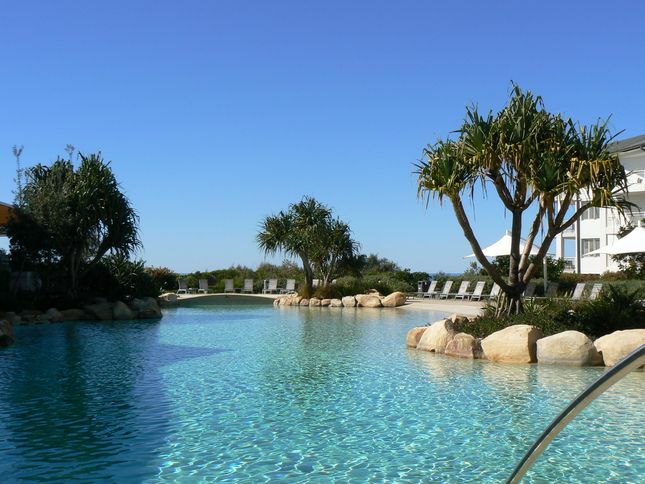 Located on Salt beach at Kingscliff in the 4.5 star Mantra resort, just 15 minutes south from Cooloongatta airport. This privately owned 1 bedroom fully self contained apartment is fully equiped with all the mod cons to make your stay as relaxing or energetic as you want to make it. As well as the king size bed in the master bedroom, we offer a pull out double sofa bed in the lounge area, with all linen & toiletries supplied for 2 guests, sheets & towels for more than 2 guests can also be supplied on request. There are 32" HD LCD TV's in the bedroom & lounge room with DVD player to keep everyone amused. The ensuite comes complete with spa bath and shower to soothe those limbs after a day exploring this beautiful area. The kitchen is fully equiped with fridge, convection microwave, oven, stove and dishwasher, as well as every appliance for cooking and all cutlery. The laundry is fully equiped with washing machine and drier. The apartment has sweeping views of Mount Warning, and the surronding hinterland. By dealing directly with the owner of this beautifully presented apartment, you can be assured of huge discounts off retail price, sometimes as much as 80%. If my calendar is blocked out for the days you are interested in, please check back in a couple of days for availability. As sometimes offers are not taken up, and dates do become available again. For 2 years running now we have been finalists in the Take a Break accommodation awards. We have also won the honor of being an Airbnb Super Host. This can assure you of a welcoming experiance and a holiday you will always remember. Check out our guest reviews to see what everyone else who has stayed with us enjoyed about our apartment. For your convienenance, we are now set up to take credit card payments. Park your car in the secured underground parking, you may choose to leave it there for your whole stay, as everything you need is right on your doorstep. The resort at Salt has a wide selection of restaurants, including, Mahsuri Thai, Fins at Salt, Ristorantee Pizzeria, Roughie's & Surge restaraunts. Coffee shops, and its own Tavern right on site with regular entertainment and dining. IGA, hairdresser, bottle shop, gift shop are all here as well. Sitting just behind the resort is a pampering Spa is located at the Salt village . Enjoy all the pampering this outlet offers from massages, facials ect. A beautiful often patrolled surf beach on your doorstep. Whales can been seen between June through to October migrating up and down the coast. A stroll up the beach will see you in the seaside township of Kingscliff. Shops, Bowls & Surf clubs, takeaways, gift shops and everything you need to stock up for your getaway. The apartment is also located close to all the Tweed coast has to offer, including clubs for all your entertainment needs. Or drive a bit further up the coast to enjoy all the theme parks the Gold Coast has to offer. Go down the coast and visit the famous Byron Bay area, only 30 minutes drive from Salt. Mt Warning and the surrounding rain forest hinterland, is a fantastic place to explore. At Salt village itself, in the central park, concerts, markets and other activities are often happening. Bike tracks surround the area, for an enjoyable ride along the ocean front and through the surrounding bushland. Can be purchased when on site. Coffee and tea making facilities made available. 2 pools and a spa on site. Did not know it was a unit in a resort as we were only advised 14 days before we departed. Hi, thanks for your review, in the details when you booked it actually states it is in the Mantra resort. The booking was only for 2 people, so stated on your booking, so I'm surprised 4 towels and 3 rolls of toilet paper is not enough for 2 people for 2 days. With the supplied washing machine & drier, there should not have been a towel issue. A 1 bedroom apartment booked through Mantra costs a lot more than what I charge. The resort rents out "Hotel" rooms cheaper, that is a room, not a fully contained apartment. Check out the hundreds of 5 star reviews I have. We enjoyed our stay at Mantra. The unit itself was clean and comfortable. Quite a decent size, considering it was a one bedroom apartment. Well stocked with common pantry items, however we did miss not having a coffee plunger. The resort facilities were great, particularly for our little family. We found that even though the weather wasn’t ideal for the beach, we could still make use of the facilities available. The Thai food was our favourite. Everything in unit is great. Resort and surrounds are beautiful. Loved our stay here. Fantastic short break at Salt. The unit is located in Salt Mantra and we were very impressed with very handy access to beach, parks and restaurants. Unit is well presented, clean and has a few a few little extras like games and DVDs. Host, Scott, was very accommodating - thanks for a great stay!